SOLE AGENCY*** with our colleague! 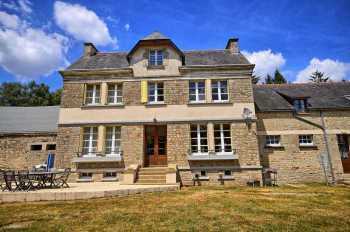 Set in the country side between the towns of Pontivy and Baud, and not far from the Blavet river is this glorious property comprising of a large "manor house" dating from around 1930, along with a large gite, a swimming pool as well as a large adjoining longère for development. The "manor house" itself offers on the ground floor: a large central entrance hall, living room, large "country" kitchen with fitted kitchen and dining area, back entrance hall and a down stairs bathroom. On the first floor there is a landing, four large bedrooms and a family bathroom. Then on the upper level is a large dormitory and a bathroom. The adjoining gite, in the longère part, offers on the ground floor a very large lounge / diner with an open plan kitchen, then there is a hall and two bathrooms. Upstairs you have a landing, five bedrooms and a family bathroom. Adjoining the other side of the "manor" is another longère of a similar size as the gite, but this time for complete renovation, and thus could ad 1-3 additional dwellings if you so wish. There is also a small open side hangar to the rear of the property. The property sits in 1 ¾ acres of grounds with a heated inground pool with patio surround and heating system. Fireplace, Internet, Car port, Barbecue.